Data protection is of a particularly high priority for Weducon BV. The use of our websites is possible without any indication of personal data; however, if a data subject wants to use special services via our website, processing of personal data could become necessary. If the processing of personal data is necessary and there is no statutory basis for such processing, we generally obtain consent from the data subject. The processing of personal data, such as the name, address, e-mail address, or telephone number of a data subject shall always be in line with the General Data Protection Regulation (GDPR), and in accordance with the country-specific data protection regulations applicable to Weducon BV. By means of this data protection declaration, we would like to inform the general public of the nature, scope, and purpose of the personal data we collect, use and process. Furthermore, data subjects are informed, by means of this data protection declaration, of the rights to which they are entitled. As the controller, Weducon BV has implemented numerous technical and organizational measures to ensure the most complete protection of personal data processed through this website. However, Internet-based data transmissions may in principle have security gaps, so absolute protection may not be guaranteed. For this reason, every data subject is free to transfer personal data to us via alternative means, e.g. by telephone. When entering our website, we will record information necessary for the operation of the website. We also collect information about your activities during your visit in order to personalize your website experience, such as recording your preferences and settings, and to collect statistics to help us improve and further develop our website. The website of Weducon BV contains information that enables a quick electronic contact to our enterprise, as well as direct communication with us, which also includes a general address of the so-called electronic mail (e-mail address). If a data subject contacts the controller by e-mail or via a contact form, the personal data transmitted by the data subject are automatically stored. Such personal data transmitted on a voluntary basis by a data subject to the data controller are stored for the purpose of processing or contacting the data subject. When you contact us (online or offline) in connection with a request for information, or to provide you with support, we collect information necessary to fulfill your request, to provide you with support and to be able to contact you. For instance, we collect your name and contact information, details about your request and your agreement with us and the fulfillment, delivery and invoicing of your order and we may include client satisfaction survey information. We retain such information for administrative purposes, defending our rights, and in connection with our relationship with you. In our relationship with clients or prospects, partners and suppliers, they also provide us with business contact information (such as name, business contact details, position or title of their employees, contractors, advisors and authorized users) for purposes such as contract management, fulfilment, delivery of products and services, provision of support, invoicing and management of the services or the relationship. Where we reference that we use your personal information in connection with a request, order, transaction or agreement (or preparing for the same), or to provide you with services that you requested, we do this because it is necessary for the performance of an agreement with you. Where appropriate, Weducon BV may share your personal information with selected partners to help us provide you, or the company you work for, products or services, or to fulfil your requests, or with your consent. When selecting our suppliers and partners, we take into account their data handling processes. Please be aware that in certain circumstances, personal information may be subject to disclosure to government agencies pursuant to judicial proceeding, court order, or legal process. We may also share your personal information to protect the rights or property of Weducon BV, our business partners, suppliers or clients, and others when we have reasonable grounds to believe that such rights or property have been or could be affected. We intend to protect your personal information and to maintain its accuracy. Weducon BV implements reasonable physical, administrative and technical safeguards to help us protect your personal information from unauthorized access, use and disclosure. For example, we encrypt certain sensitive personal information such as credit card information when we transmit such information over the Internet. We also require that our suppliers protect such information from unauthorized access, use and disclosure. We will not retain personal information longer than necessary to fulfil the purposes for which it is processed, including the security of our processing complying with legal and regulatory obligations (e.g. audit, accounting and statutory retention terms), handling disputes, and for the establishment, exercise or defence of legal claims in the countries where we do business. You have the right to view, correct or delete your personal data. You also have the right to withdraw your consent to the data processing or to object to the processing of your personal data by Weducon BV and you have the right to data portability. This means that you can submit a request to us to send the personal information we hold to you or another organization mentioned by you in a computer file. Weducon BV does not use automatic decision-making or profiling. 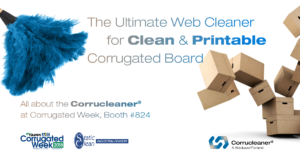 Why a web cleaner for corrugated board? The corrugated & packaging market needs consistent quality, printability, waste reduction & clean and healthy working conditions. Where do you need to get rid of dust and fibers? The Corrucleaner® HE 90 is developed by Weducon. With over 30 years of experience in the field of webcleaning, our mission is to let our customers achieve optimal results by lengthening clean-up distances, increasing imprints and improving quality.